I am starting to lose track of time. A month nights, a year of days. October drifting into May. Tony was surprised recently when I mentioned it was Sunday. I’m not that bad, although I do have to look at a calendar to figure out the date. Mid-February already? The breezy, sunny days flow together like summer vacation as a kid. We are waiting out the snow and ice in ranch country, 30 miles from the beach. Steers outnumber people here in south-central Florida. A bit further south is sugar-cane country, where harvested fields are set afire to prepare them for the next crop. In a state without hills, let alone mountains, the plumes of black smoke are visible for miles. We are trying to eat local, but it’s difficult. I inhale as many honeybells and grapefruit as I can, but a watermelon I bought at a farm stand turned out to be from Guatemala, and local seafood and beef are elusive. A butcher explained why I can’t find local beef. Florida has plenty of pastures but few if any feed lots where cattle are fattened up before slaughter. Florida herds are shipped north on the hoof rather than butchered here. The dearth of local seafood is inexplicable. I have had a hard time finding a seafood store even on the coast. Ideally, I’d like to buy some fish directly from a boat. We’re still looking. Meanwhile, we drove a couple of hours Sunday to a seafood festival in Port Everglades for a few nuggets of fried alligator and some chewy fried clams. I bet they were frozen. The festival had more to offer, but the crowd was dense. On our way out of town we stopped at the Marathon gas station to load up on stone crab claws, the specialty of the region. We scored a 3-pound bag, frozen, for $30. Yes, at a gas station. I’ll cook the crab claws this week. The only cooking I did last week was a chicken salad and some sausages. Yeah, not exactly Florida food. The salad was delicious, though. I couldn’t stop thinking about the combination of rice, chicken, dates, almonds and pineapple after Kris F. described it in an email I shared last week. What if I used basmati rice, I mused? And added some warm spices such as cinnamon and nutmeg? The resulting salad was so addictive I finished off the leftovers for breakfast. Thanks, Kris. Combine, chicken, rice, pineapple, almonds and dates and mix well. Sprinkle with salt, cinnamon and nutmeg and mix again to distribute spices. In a small bowl, beat together mayonnaise and juices. Pour over chicken mixture and stir well. Makes 4 servings. I found a substitute for Miracle Whip. Look no further than the Japanese section of your nearest Asian grocery store where you will find Kewpie mayonnaise. It is a virtual clone of Miracle Whip, which was basically ruined when the fat content was reduced a few years ago, resulting in dressing that turns watery on salads overnight. Not much. 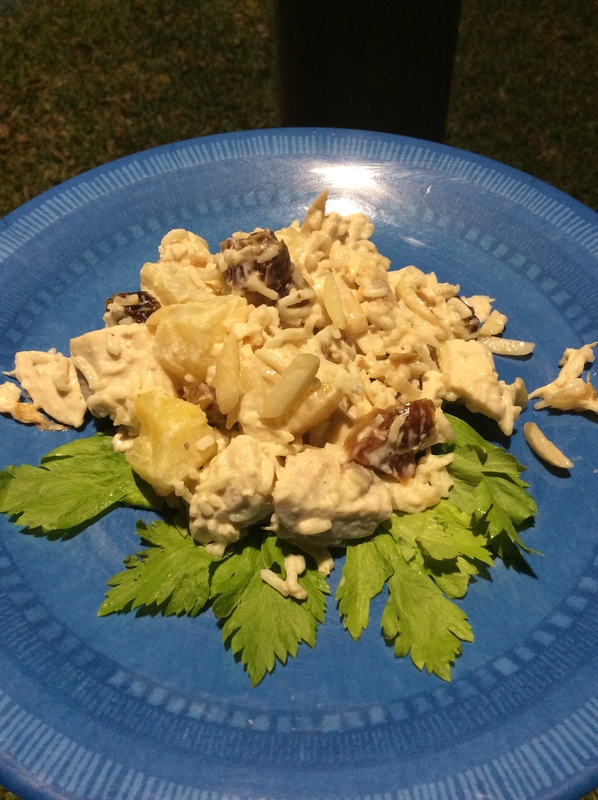 A chicken-rice salad with dates and pineapple; pan-grilled Italian sausage. Ground beef patty, cottage cheese and fruit at Pogey’s in Okeechobee; cream cheese wonton, Mongolian beef (sort of) and hot tea at Chen’s in Okeechobee; a Cuban sandwich, plantain chips, yuca fries, beef and chicken empanadas and a coconut pastry from Mervis’ in Ft. Pierce (spread over three meals); two biscuits and jam from Pogey’s; chicken and beef empanadas from Mervis’ in Ft. Pierce; fried alligator, fried clams and hush puppies at the Everglades City Seafood Festival. In reply to Sherrie W. asking about beans, perhaps she can benefit by going to this website: https://www.ranchogordo.com/. It’s called “Rancho Gordo” and they sell a large variety of heritage beans. I’ve tried several and they have all been exceptional. The website describes each variety they sell and what dishes they could best be used in. They also have many recipes using beans and I’m sure she could find a variety that would please her here. It’s the only place I buy beans now. When Sherrie mentioned she used to buy beans online, this is the site I figured she used because it is considered the best. If not, I urge her to try Rancho Gordo. At the very least, she should find a good substitute for the beans that no longer seem crisp. Geoff, your email gave me the idea of buying dried fava beans online. With their dopamine content, my mood swings soon may be a thing of the past. Tony thanks you. I am so tired of dealing with garlic cloves. They’re sticky and it’s hard to get rid of the skins. What do you think of the substitutes for fresh garlic, like marinated minced garlic and dehydrated minced garlic? Both of these come in jars and are so much easier to use. I hear you, but unfortunately nothing packs the punch of fresh garlic. I think packaged, minced garlic pales in comparison. Tony found peeled whole cloves once that were great, but they came in such a gargantuan package that I couldn’t use them all before they shriveled. I have tried various short-cut methods of peeling garlic with no success. The skin is supposed to fall off if you shake the whole cloves in a lidded jar, but it didn’t work for me. Maybe if I had continued shaking for 15 minutes, but otherwise, no. One tip: If you wet your hands and knife before mincing, the garlic won’t be as sticky. Besides groceries, my purchases in Florida so far have been one soup bowl and a packet of elastic bands for my unruly hair. On Sunday alone, I talked Tony out of acquiring a 6-foot cardboard Tony Tiger and a curb-alert brown leather sofa. He wanted the sofa badly. Tony: Load it in the truck and take it back to Ohio. I don’t want to spoil Tony’s fun, but we are living for two months in a 1-room (plus bath), 22-foot travel trailer with a Murphy bed. Last week at the flea market Tony bought an abacus-like back massager, two large loofah sponges, a small lidded pan and a high-backed rattan counter stool. We don’t have a counter. He wanted to fit the stool into the five square feet of floor space that already is junked up with a leather-like ottoman (“for the dog”) and footstool he bought at a second-hand store. Our entire marriage has been a push-pull between Tony’s wanton urge to buy things and my desire for responsible consumerism, between his tendency to hoard and mine to pare back. And then last week I watched “Tidying Up with Marie Kondo” on Netflix. Oh, boy. Marie is author of the best-seller, “The Life-Changing Magic of Tidying Up.” Her theory is that people should prune their possessions down to the few things that “spark joy”. Hold that chipped paring knife in your hands, one of six in the drawer, and close your eyes. Do you feel joy? If not, ditch it. Which brings me to the 50-cent yellow bowl I bought Sunday at a flea market. It does not spark joy, but I can’t keep using the same cheap blue and white Corelle dinner ware for my newsletter photos. 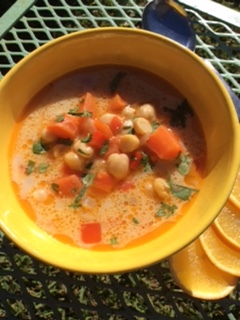 So I hope you enjoy the photo of this week’s recipe, a coconut chickpea soup with notes of ginger and orange. The recipe, with minor changes, is from the Florida Citrus Commission. The coconut-ginger broth is so good I plan to use it in other recipes, such as quick bowl dinners (add a grain, protein and wilted greens) and steamed mussels. While slurping, it’s hard to remember the soup is vegetarian. If you don’t normally cook with vegetable broth, feel free to use chicken broth instead. If the chickpeas aren’t hearty enough for you, toss in a handful of cubed tofu or some shrimp. The yellow bowl in the photo goes to Goodwill as soon as we return to Akron. I wish I could say the same for the rattan stool. Heat oil in a soup kettle. Add onions, carrots, bell pepper and salt. Sauté over medium-high heat until onion is translucent. Add ginger and garlic and sauté 1 to 2 minutes, until fragrant. Stir in coconut milk, broth and chickpeas. Bring to a boil, reduce heat and simmer for about 15 minutes to blend flavors. Remove from heat and stir in orange juice. Ladle into bowls and garnish with cilantro if desired. Make 6 to 8 servings. Grilled blue cheese burgers on buttered, toasted buns; shrimp cocktails, bloody Marys and grilled corn; coconut chickpea soup with orange and ginger. Hamburger patty, cottage cheese and a ton of diced fresh fruit at Pogey’s in Okeechobee, Fla.; ground beef empanada and a media noche (Cuban sandwich on sweet bread) at Tropical Latin Food in Port St. Lucie, Fla.; McDonald’s hamburger Happy Meal (for the wi-fi connection, I swear); a chocolate glazed doughnut at Dunkin’ Donuts; a piece of black olive, pepperoni and onion pizza and a garlic knot (a fresh dinner roll drenched in chopped garlic and butter) at Joey’s Pizza in Okeechobee; a chicken salad sandwich on a toasted onion bagel from Max’s Bagels in Stuart, Fla. 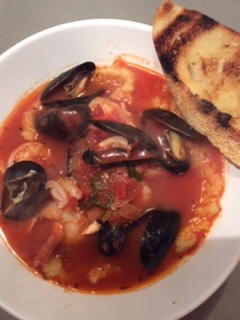 I made cioppino, too, just before your newsletter with the recipe came out. Aldi sells (seasonally) a bag of mixed seafood which includes scallops, mussels, shrimp and calamari. With all the seafood ready to go, it made it a quick after-work meal. It was almost as good as the version with the hand-selected seafood. Good to know. When I’m not near an ocean, I will check it out. I have found a lot of cool products at Aldi, from the Seedtastic bread to the inexpensive six-packs of bone-in chicken thighs to my current crush, snappy-crisp dill gherkins. Well, she passed away very suddenly over 20 years ago and I never got the recipe. I have scoured the internet and Googled the ingredients, all to no avail. Her magic recipe: chicken, pineapple tidbits, dates, slivered almonds and rice. My palate was not sophisticated enough to tell if it was Miracle Whip or real mayo, but the combination was heavenly. There were also tiny flecks of brown in the salad — cinnamon? bits of dates? I’m writing to see if you have ever come across this recipe. The ingredients sounded pretty normal until I got to the rice. I’ve never seen that in chicken salad, although now I want to taste it. Maybe the brown flecks were grated nutmeg? Maybe it was a rice salad recipe to which she added chicken? The recipe is unusual enough to stick in the mind of anyone who has come across it. Can anyone help? I need some fava beans, quick. Like a moth to a flame, I have been drawn to forbidden sweets lately in an unconscious quest to boost the feel-good chemicals in my brain. I hate this but on the other hand, how else would I have discovered Caribbean coconut roll last week? Yes, it’s complicated. Short version: I am not depressed, but my brain is genetically low in the chemicals that keep me happy. For years I have solved the problem with medication but now want to do so naturally. That means listening to music, meditating, getting plenty of sunshine and eating fava beans, the only food known to contain dopamine, one of the substances my brain is craving. Sugar will give me a temporary feel-good jolt, but I’d like to avoid cleaning out every pastry shop in South Florida. one of the pastries stacked on the counter, and fled. The scent of vanilla and coconut washed over me when I opened the plastic clam shell in the car. Wow. I figured “coconut roll” would be a sweet bread, but no. 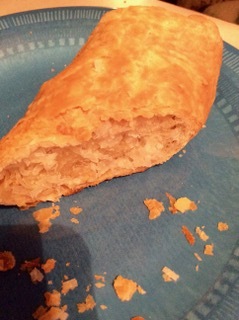 It was a roll of flaky pastry wrapped around and around a thick coconut filling. The roll, cut in half for packing, was about 7 inches long and 2 inches in diameter. The interior was moist and bread-y from the dough spiraled around the filling. The flavor was — well, imagine a mouthful of buttery, flaky, mellow coconut goodness. It was as gentle and cozy a delivery system for coconut as I’ve tasted. Later I found a recipe for the coconut roll, which turned out to be a Trinidad version. Many islands in the Caribbean have coconut rolls, all with slight variations. Some tint the filling pink. Some slice before baking. Trinidad does neither. The following recipe is from The Schizo Chef at www.theschizochef.com/2016/03/coconut-roll/. I have not tried it but the winter is young and I haven’t found fava beans yet. Lord help me. For pastry: In a large bowl, combine flour and salt. Add shortening and butter. Using a pastry blender, cut fat into flour until it resembles small peas. Add water and mix just until dough comes together. Wrap in plastic wrap and chill in refrigerator for 1 hour. For the filling: Combine all filling ingredients until thoroughly combined. Assembly: Preheat oven to 350 degrees. Place a piece of parchment paper on a cookie sheet and spray with non stick spray. Make egg wash by whisking together the egg and water for the topping. On a lightly floured board, roll out dough into a rectangle. Spread filling on top. Starting on the long side, roll into a tight cylinder, sealing the ends. Transfer to cookie sheet. Brush the top with egg wash. Sprinkle sugar on top. Bake for 1 hour, until golden brown. Slow cooker pork, bean and green chili stew; grilled kabobs of marinated top sirloin, baby bell pepper, onion chunks and chunks of corn on the cob; grilled meatloaf burgers, grilled mixed peppers drizzled with vinaigrette, grilled corn on the cob. Scrambled eggs, ham steak, grits, biscuit and coffee at Pogey’s in Okeechobee, Fla.; a rueben sandwich at Pogey’s; a chocolate glazed doughnut at Dunkin’ Donuts; Popeye’s 3-piece chicken and a biscuit; roast marinated pork, maduros (sweet plantains), black beans, yellow rice and a cafe con leche at El Cubanito Cuban Restaurant in Port St. Lucie, Fla.; a Trinidad coconut roll from Jerk City in Port St. Lucie; grilled shrimp and spicy grits with garlic bread at Good Spirits Lounge near Okeechobee; eggs over easy, grits, ham, biscuit and coffee at Pogey’s. (For Gail B. ), I print your recipes by simply copying them and pasting into a Word document. Highlight the text you want, right click within the highlight and choose “copy.” Open a new Word document, right click on it and choose “paste.” Then you can make adjustments if you want, print it, and save it. Thank you to those who offered suggestions: Debbie N., Dorothy T., Dorothy B., Christine S., Sura S., J.S., Pennie, Sue D., Judy A., Cindy W., Barbara S., Peggy K., Kay in Santa Fe, Ron C., Iris, Carol W., Ellen, Pat and Deb C.
I just printed your recipe for bean stew and can’t wait to fix it. Also, I’m curious about what Tony cooks on a 7-inch electric grill. I measured Tony’s dinky grill and it is actually 10 inches in diameter. It looks smaller because the electric element sits inside a ceramic dish that resembles a soufflé dish, with a grid on top. It is a Japanese thing; they do a lot of grilling at the table. I didn’t think the grill would be effective because we have a bunch of them taking up space in the basement, and the one I tried didn’t emit enough heat to cook a shrimp. This one surprised me. Tony fired it up to grill corn on the cob, peppers and hamburgers, in shifts. It cooked everything slowly but surely. The jury’s still out on the toaster oven. I’ve always wanted to know, what do you do with your leftovers? The bean stew recipe you ran last week serves 10. There are two of you. While I like leftovers, what’s a lot of leftovers. Do you freeze and then really reheat? I hate to waste food but I also hate eating the same thing all week long. Sometimes I freeze leftovers, but typically I eat them. I love leftovers. Tony does not. Usually it’s just me and a big pot of whatever. We each had two bowls of the stew initially, then I ate stew the next morning for breakfast. It was the perfect breakfast — protein and vegetables in a warming broth. I had it again for lunch and dinner, and lunch the following day and then breakfast again. I was sad when it was gone. Meanwhile, Tony was happy eating peanut butter toast for breakfast and doctored-up instant ramen noodles for dinners. He eats a lot of ramen and spaghetti while I eat leftovers, fresh fruits and vegetables, yogurt, protein shakes and other healthful stuff. My brother brought us up to date via Facebook: “I’m sorry you’re missing the weather today — 16 degrees.” It was our second day in Florida. The temperature had dipped to about 45 degrees overnight and by morning had risen to a crisp 55. Not as frigid Ohio, but still soup weather. I came prepared. Unlike last year, when I brought no recipes and found the Internet in our campground had been wiped out by a hurricane, I came this week with a clutch of recipe ideas to try. I brought a slow cooker, a rice cooker, a grill and freshly sharpened knives. Our camper is equipped with a 3-burner stove, a midget oven and a microwave. If pressed, I could probably make a multi-course feast with that equipment. Okay, then. Maybe we can eat his toast with the Southwestern pork and Navy bean stew with green chilies I made for dinner. It simmered all day on the kitchen counter in the slow cooker, and it smells heavenly. It tastes pretty good, too. I had a test bowl after 7 hours and another after 8. By then the white beans had broken down and become creamy. The thick stew is studded with big cubes of tender pork, slices of sweet potato and bits of mild green chilies. I deepened the flavor with onions and garlic and seasoned the stew with plenty of cumin and oregano. I heated the slow cooker on high as I cut and added the ingredients. By the time the last can of beans was drained and scooped into the pot, the temperature of the mixture had risen enough to skip the usual 15-minute preheat on high. This will be convenient for those who assemble the stew before work. As for me, I’m just hanging around the camper, listening to my stomach growl and waiting for that toast. Heat a slow cooker on high. Chop/measure/prepare each ingredient and add to a slow cooker in order given. Stir, cover and reduce heat to low. 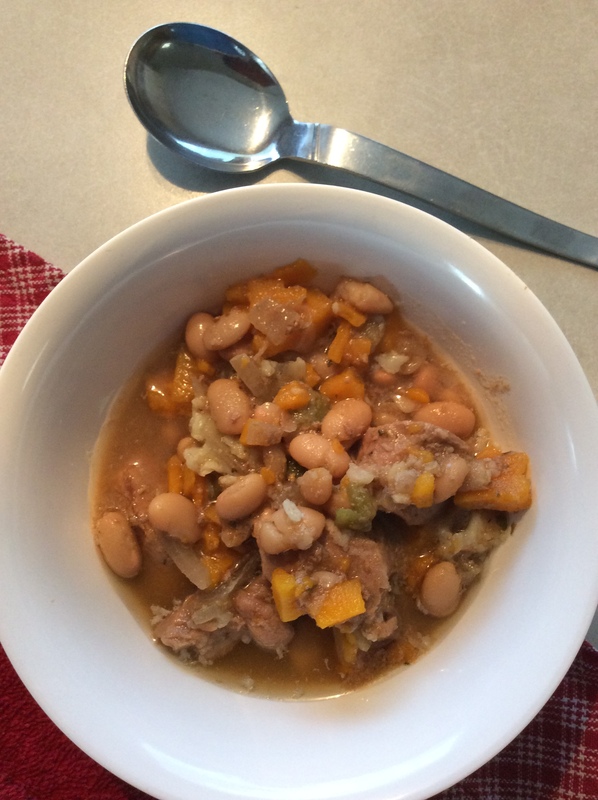 Cook for 8 hours or until pork is tender and beans are soft and creamy. Ladle into bowls and sprinkle with more salt to taste. Makes about 10 servings. Egg salad; scrambled egg on seeded toast with hot sauce. Southwest salad with chicken and a hunk of baguette at Panera; a Burger King Croissanwich; chicken teriyaki skewer, one salt and pepper shrimp, two spoonfuls of chicken stir fry and a sugar-dusted fried doughnut at Szechuan Buffet in Statesville, N.C. (the only place we could park with a camper in tow); pulled pork, potato salad, corn dodgers and iced tea at Bar-B-Que Hut in Sumter, S.C.; a bacon and pineapple pizza from Pizza Hut in Jacksonville, Fla. (delivered to our motel room); a pulled pork and slaw sandwich and Diet Coke at Memaw’s Bar-B-Q in Palm something (Bay? Harbor), Fla.
How do I print some of the recipes you put in your weekly newsletter? I cannot find a print icon. I even went to your blog but no icon there, either. Thanks. I’m sharing your question because others have asked, too. I also get questions about why there is no way to post recipes to Pinterest and other collection sites that enable users to keep track of recipes they want to save. Unfortunately, I can’t help because I don’t handle the physical production of the newsletter. The kind folks at Mimi Vanderhaven manage the mailing list and editing functions, and I am grateful for their help. I will ask them again if there’s a way to add these features. Meanwhile, maybe there’s a computer whiz out there who has an easy solution for printing recipes from this newsletter. I’m cooking for just myself for a few days while Tony is off to a cabin in the woods, leaving me in charge of the dog and packing for our annual trip to Florida. We leave this week. We will be gone for two months. I could kill him. So far I have gathered up a stack of summer shirts and the dog’s medicine. I am frantically making lists and doing laundry while subsisting for two days now on crackers and a big bowl of chicken salad. Today (I’m writing this on Sunday), I will treat myself. At 6 p.m. I will turn on the TV to watch the Golden Globes red carpet while dining on pan-grilled salmon with coconut-lime sauce. I don’t have a lot of time to cook, so I dreamed up a dish that produces lots of flavor in about 15 minutes, tops. I will savor the break and try not to feel guilty. I envy Tony, who is much better than I am at pampering himself. He lives in the moment. Then again, somebody has to pack. Heat a medium skillet. When warm, add 1 tablespoon of the oil and swirl. Slice white part of onions and sauté with garlic in the warm oil for 1 minute, just until garlic begins to soften. Add soy sauce, coconut milk, lime juice and ginger and bring to a boil. Remove from heat and set aside to cool to room temperature. Heat a heavy skillet large enough to hold the salmon over medium-high heat. Add remaining 2 tablespoons oil, swirl and heat. Place salmon fillets, skin sides down, in skillet. Spoon some of the hot oil over the salmon and sprinkle with sea salt. Cover, reduce heat to medium and cook for about 7 minutes for 1-inch-thick fillets, or until salmon is done to your liking. Spoon some of the sauce onto each of 4 dinner plates. 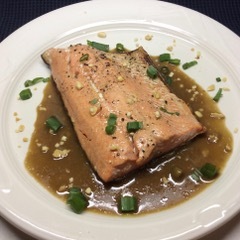 Place salmon fillets on top of sauce. Chop green onion tops and scatter over salmon. Scatter peanuts over fillets. Makes 4 servings. Roasted kabocha squash with sweet soy sauce, pan-grilled strip steaks; overnight oats with dried cranberries and slivered almonds; venison spaghetti sauce; chicken salad with red sweet peppers and celery; pan-grilled salmon with coconut-lime sauce. Half of a Southwestern chicken salad and a piece of baguette at Panera; Wendy’s chili with Cheez-its. I know the holidays are past along with the need for sauerkraut ball recipes, but I wanted to tell you about the gluten-free ones we make for my celiac family. I substitute Earth Balance spread for the butter, use gluten-free flour (Pamela’s), and put gluten-free Rice Chex in the blender for the coating. They turn out great. Thank you for sharing that. I’m sure many people will try your suggestions. Do you have a recipe for the hot sauce served at Aladdin’s Restaurants? I’ve tried imitating it and searched online for recipes to no avail. The sauce is a condiment frequently offered for an additional cost if you order hummus. It looks a bit like a vinaigrette dressing in that is separates. It is orangish, with chunks that are finely diced peppers and garlic, perhaps. We like it for dipping falafel or just to add some spiciness to any of our meals. You have piqued my curiosity. I’ll have to try it. Meanwhile, if anyone shares a recipe I’ll let you know. I remember packing raw chickens in dry ice at breakneck speed to make the final Fed Ex pickup of the day. The birds were going to a food lab in Columbus to determine how the chickens in Akron supermarket chickens stacked up against the national average of salmonella in chicken. (Result: about 30 percent were contaminated, same as nationwide). I remember the day a photographer coaxed me into a fort built from hundreds of my cookbooks for a picture to go with a story about cookbook collecting. Before he could snap the photo, the heavy rear wall of the fort toppled onto me, bruising a shoulder and almost burying me. I remember interviewing a nice guy in a kitchen absolutely trashed from an apparently intense cooking session. Although the photographer had a tough time getting a serene shot, I loved the guy’s green chili stew. For years afterward I imagined the scene when his wife got home from work that day: You let them photograph this?? I remember naming the sauerkraut ball Akron’s iconic food, and Gino’s its best pizza. I remember generous chefs who shared their knowledge and recipes and readers who shared their life stories. 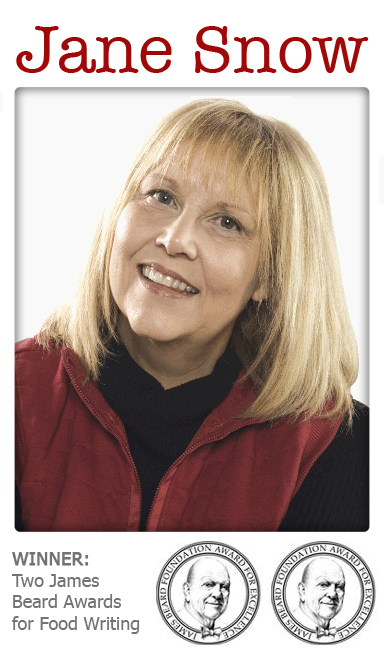 In 24 years as food editor of the Akron Beacon Journal, I amassed a lifetime of memories. I held the position from September 1982 through November 2006, the latest in a line that stretched back to the 1800s. Standouts along the way were Glenna Snow (1932 to 1946) and Polly Paffilas (1961 to 1974), but all 12 of the food writers whose bylines I unearthed in the newspaper archives helped Akron-area readers shop and eat better and more knowledgeably. Today I’m asking what YOU remember. I am writing a chapter on the Beacon Journal’s food coverage as part of a history of the newspaper untaken by my colleagues. The eventual book will be published by the University of Akron Press. I would like to include readers’ comments on what they liked (or disliked) about the Food section. I know what I think — the design, artwork and photography were some of the best in the country, and the content when I was writing the section was the result of much blood, sweat and tears. But what about you? Are there any articles you especially remember? Were you helped by any of the nutrition or food safety advice? Did we make you laugh occasionally? Did any recipes become favorites? In sum, what made the Beacon Journal’s food coverage special? Many of the recipes I printed became favorites of mine. Among the treasured stack I keep in a mixing bowl in the kitchen are recipes from readers, chefs and cookbooks, along with a handful of recipes I created. Do you have a favorite? The following bread pudding recipe is one of mine. It is from reader Geoff Hewitt, who was profiled in an In the Kitchen column in 1988. The addition of pecans and shredded coconut puts his version over the top. Tear the bread into pieces of various sizes and let air-dry for three days. Spread chopped pecans on a baking sheet and toast at 350 degrees for 15 minutes. Combine all ingredients except bread and mix well. Add bread and stir well, using your hands to thoroughly mix the ingredients. The mixture should be quite moist but not soupy. Add more milk if it appears to be too dry. Pour into a greased, 9-by-13-inch baking pan and bake at 350 degrees for one hour and 15 minutes. Serve warm with bourbon sauce. Stir butter and sugar over low heat until sugar is dissolved. Remove from heat and stir in egg yolk. Stir in bourbon gradually. Heat until warm but not boiling. Spoon over individual portions of bread pudding. Baked brie en croute, marinated chicken kabob, steamed rice, couscous, green salad and a cut-out cookie at my niece, Heidi’s; chicken pad Thai at Giant Eagle in Cuyahoga Falls. “The West Point Market Cookbook” by Russ Vernon is for sale on Amazon. I was stunned to see how much the book has soared in price since it was published in 2008. Used copies are going for as much as $132 on Amazon, although a number of more reasonably priced copies in good condition can be had for $25 to $30. Again, I would check the shelves at the Bookseller in Akron first. A book you said you want to get, “The Flavor Matrix,” sounds good. Have you read “The Flavor Thesaurus”? It is what the title says it is: Synonyms and antonyms for flavors. I also recommend “Salt, Fat, Acid, Heat” by Samin Nosrat. Both books are great for understanding flavors. It’s good to see that you were recently at Sushi Katsu (in Akron’s Merriman Valley). We were just talking about it yesterday! My son and friend had both been there but it was years ago, and they really enjoyed it. I told them I wasn’t sure how it is since Tony left but apparently it’s pretty good if you were there. Any other thoughts? Tony and I go at least once a month. The sushi is very good. Tony taught the chefs before we handed it over. Sometimes there will be something not up to Tony’s standards, and he will make the chefs aware of it. The sushi is more adventurous under chef Tin than it was under Tony, who is a sushi purist. The tired decor, which Tony wouldn’t let me change, is sleek and modern now. Go! Enjoy! First came the Vietnamese noodle soup, pho. Then came the Japanese noodle soup, ramen. The two Asian soup trends steamrolled across the country, leaving pho and ramen restaurants in their wake. Except in the Akron-Canton area, where restaurants devoted to the slurpy, soul-warming ramen are scarce. Oh, sure, you can find bowls of ersatz ramen on restaurant menus, but no restaurants devoted to the stuff until now. Ramen Katsu, a sister restaurant to my husband’s former restaurant, Sushi Katsu in Akron, has opened in Green with a menu absolutely brimming with ramen. There’s miso ramen, shoyu (soy sauce) ramen, vegetarian ramen and build-your-own ramen. A tiny problem: the broth is too sweet for my taste. The toppings and noodles are stellar, though. But before you get to the main part of the menu, zero in on the appetizers — specifically, a version of edamame that is worth the trip alone. 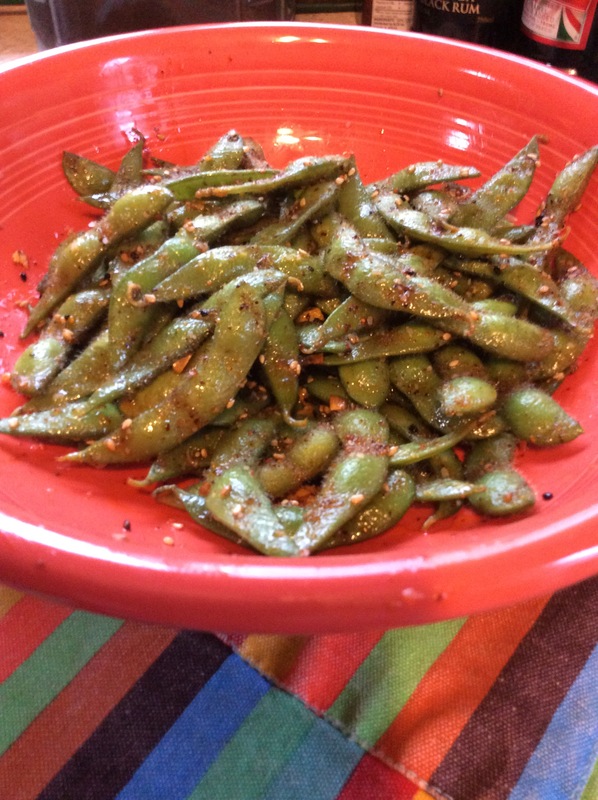 The green soy beans are usually served in their pods, salted and steamed. Diners peel off and discard the pods and eat the tender beans. At Ramen Katsu, you’ll want to linger over the pods awhile before discarding them. That’s because the pods are seasoned with plenty of chopped garlic, sesame seeds, chili pepper flakes and salt. Getting to the beans inside is a delicious journey. The pods at Ramen Katsu are almost tender enough to eat, and I did chew on a few of them although they’re meant to be discarded. Either way, you’ll get enough of the seasoning to make your mouth sing. Remove frozen edamame from wrapping and place in a microwave-safe bowl. Microwave on high power for about 3 1/2 minutes, or until the beans are warm and completely thawed. Heat a large skillet over medium heat. When hot, add oil. When oil is hot, stir in garlic, sesame seeds, togarashi and salt. Cook and stir until garlic is golden and mixture is fragrant. Add beans and continue to cook, scooping and stirring, for 1 minute or until beans, oil and spices are thoroughly mixed. Pour into a bowl and drizzle with chili oil, adding more or less to taste. Toss again and serve. Makes 3 to 4 servings (or 1 if you’re Tony). 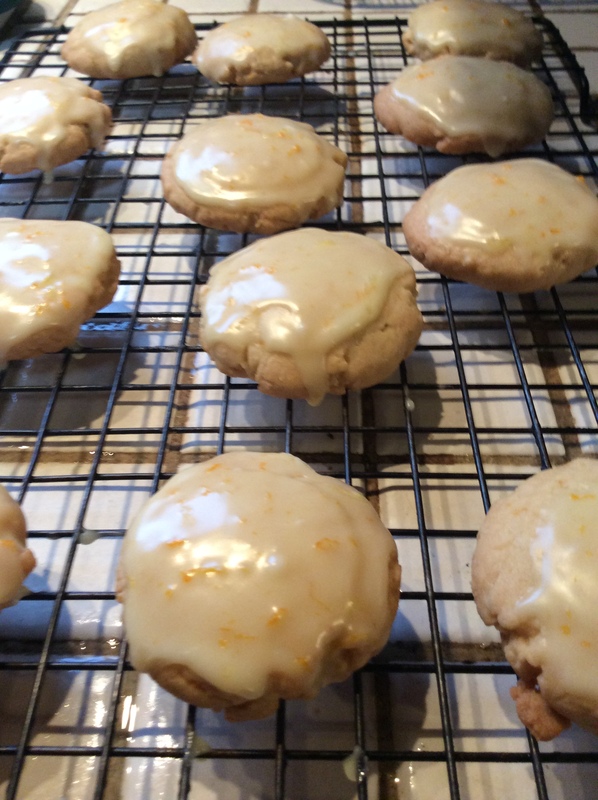 Here’s a bonus recipe for a cookie so good I made it twice this month. Position two oven racks in top and bottom third of oven. Preheat oven to 350 degrees. Line two cookie sheets with parchment paper. In a bowl, whisk flours, baking soda and salt together. In a mixer, cream together the sugar, butter and orange zest at medium speed until light and smooth, about 3 minutes. Scrape down the sides of bowl frequently. Add egg and mix. Add one egg yolk and mix. Add remaining egg yolk and mix. Stir in dry ingredients just until combined. Scoop heaping tablespoons of dough onto parchment, leaving about an inch between cookies. Press each one down lightly with 2 fingers to flatten to a thickness of 1/2 inch. Leave any ridges and valleys on top of cookie intact, but smooth the edges. Bake about 15 minutes, rotating cookie sheets halfway through. Cookies should be pale but baked all the way through. Cool. From Julia Moskin in the New York Times. For the icing: Place confectioner’s sugar in a small bowl. Grate the zest of the orange (just the colored part) into the bowl. Juice the orange and stir in 3 tablespoons until smooth. Add more juice if necessary to make a thin icing that slowly drips from a spoon. When cookies are cool, dip the tops of the cookies in the icing. Set aside to dry. Store in lidded containers at room temperature or freeze. • “The Flavor Matrix: The Art and Science of Pairing Common ingredients to Create Extraordinary Dishes” by James Briscione with Brook Parkhurst. This is no ordinary book about flavor mashups. IBM’s Watson supercomputer was used to compare chemical compounds in various foods and match ingredients that have similar traits — green beans with pineapple and olives with chocolate, for example. This is exciting stuff for a recipe developer. • “Dorie’s Cookies” by Dorie Greenspan. This book, filled with luscious cookie recipes (the chocolatey World Peace Cookie is already famous) from the inimitable Greenspan, won the James Beard Award for Best Baking and Dessert Book this year. • “The Adventures of Fat Rice” features 100 recipes from the “cult favorite” Chicago restaurant Fat Rice. I can’t wait to try Macau-inspired dishes such as minchi, a Macau meat hash, and Po Kok Gai, a Portuguese-Chinese mashup chicken curry with olives. This is flavorful cooking with an exclamation point. Mexican eggnog; scrambled egg whites and avocado on toast; potato and spinach soup; pot roast with wine and thyme, sautéed cauliflower rice with vegetables; pancakes, bacon and eggs; pickled eggs; homemade tomato soup with grilled cheese croutons; mini microwave fruitcakes soaked in Grand Marnier; potato salad; no-knead bread; truffled risotto with pan-grilled shrimp and an antipasto platter; potato salad. A hamburger slider with onions from Hamburger Station in Akron; a California roll from Sushi Katsu in Akron; a pickle dog (beef hot dog with mustard, onion and grilled dill pickle spear) from the Stray Dog Cafe in Akron. Re: West Point Market alternative — I really like the Miles Farmers Market on Miles Road in Solon. Superior produce, great meat, pretty decent baked goods and prepared foods (not as nice as West Point Market, though), and lots of specialty items. I try to go there every time I’m up on the East Side for an appointment or errand. The Heinen’s stores in Hudson and especially in Brecksville are pretty swell, too. Wish I hadn’t donated my West Point cookbook during one of my purges. Regretfully, I can’t find mine, either. I’m sure the University of Akron Press would be pleased to sell us copies. The Bookseller in Wallhaven probably has some used ones available, too. You have to try coquito. It is a coconut version of a type of eggnog using cream of coconut, coconut milk, sweetened condensed milk and 151 rum. Generally it is made at home and is served in small glasses. There are several recipes on the internet and youtube. Ask any Puerto Rican friend about it. Coconut cream AND sweetened condensed milk? Maybe I should just glug a bottle of Karo. Anyway, coquito sounds wonderful to this coconut lover, although far too sweet for me to try. Others may want to give it a go, though. Are you sure your killer brownie recipe is correct? Both the West Point cookbook and the Beacon Journal say 2/3 cup evaporated milk. I’ve heard of Appalachian old-timers who kept crocks of eggnog on their chilly porches in the weeks leading up to Christmas, replenishing the pot each time visitors sampled the libation. No wonder people used to “go visiting” at the holidays. I love eggnog with a fierceness fueled by unfulfilled longing. I gave up the drink long ago when I spied the calorie count on a carton of Smith’s: 170 per half cup. This week’s recipe, homemade Mexican eggnog made with 2 percent milk and Splenda, whittles that down to 124 calories without the rum— still not diet food, but geez, it’s Christmas. And when I foam the eggnog and fill half the mug with hot coffee for an eggnog latte, it’s almost guilt free. I stumbled across Mexican eggnog, or rompope, by accident while searching for Latin American Christmas traditions. I was curious last week after I enjoyed lunch at a newish Puerto Rican restaurant, Hayuya Puerto Rican Cuisine on Canton Road in Akron. 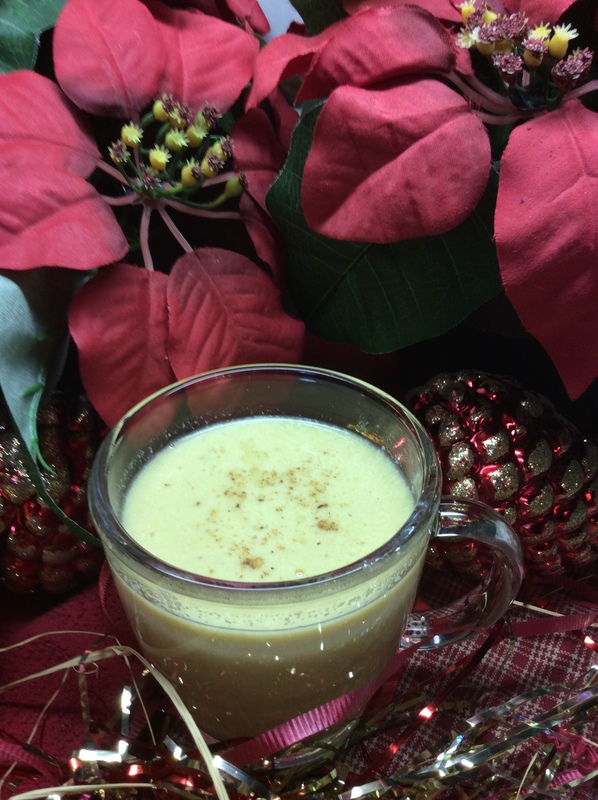 Before I could get to Puerto Rican Christmas recipes, up popped a bunch of recipes for rompope, a cinnamon-spiced eggnog that originated at a nunnery in Oaxaca. In essence, milk is steeped with cinnamon sticks and a selection of spices that changes according to the whim of the maker. Cloves, citrus peel, nutmeg, vanilla and almonds are some popular choices. After steeping, egg yolks are whisked into the milk and cooked and stirred until thickened. Some recipes call for ground almonds to thicken the nog, but I found if you are patient and stir it over low heat, the eggs will thicken it sufficiently. Warning: Do not allow the egg-enriched mixture to come to a simmer or the eggs will scramble and clump. Right about now, seasoned cooks are concluding that Mexican eggnog is basically creme anglaise or what the English call “pouring custard.” Maybe so, but who hasn’t wanted to drink custard? I still have some in the fridge if anyone wants to drop by. Place milk, sugar, baking soda, cinnamon, clove and orange zest in a saucepan. Watching carefully, bring to a simmer, lower heat, cover and simmer for 5 minutes. Do not walk away because you must adjust the heat after covering it, or it might boil over. Remove from heat, still covered, and steep for 30 minutes. Uncover milk mixture and strain out cinnamon sticks, clove and orange peel. Stir in nutmeg. Allow to cool while separating eggs and placing yolks in the bowl of a mixer. Beat yolks until pale yellow and thick. Ladle in warm milk mixture in a thin stream while beating on medium-high speed to prevent eggs from cooking. When all the milk has been added, return it to the saucepan and cook over medium-low heat, stirring constantly, until the nog has thickened enough to coat the back of a spoon. Do not allow the mixture to come to a boil or even a simmer or the eggs will curdle. Remove from heat and stir in vanilla and rum. Serve warm or, even better, chill overnight to allow the flavors to blend before serving. Dust the top of each serving with nutmeg if desired. Makes 8 half-cup servings. This recipe is an amalgam of several recipes found on the Internet. Pan-grilled, oven-finished sirloin steak (shared with our dog for his 12th birthday) sliced and served over cauliflower rice with vegetables; hot pepper crackers; skinless chicken thighs simmered with wine and sauerkraut; pork and bell pepper stir fry with five-spice Szechuan sauce and Szechuan peppercorns; scrambled eggs and orange sections with toast and sugar-free blackberry jelly. A stellar beef empanada, roast pork shoulder and fried ripe plantains at Hayuya Puerto Rican Cuisine on Canton Road in Akron; tonkatsu (breaded pork cutlet) miso ramen with eggplant and mushrooms, spicy garlic edamame and two pieces of a California roll at Ramen Katsu in Green; Nashville hot chicken thigh and leg, mashed potatoes and a biscuit at KFC in Wadsworth. Judy James is looking for a sauerkraut ball recipe, but not just any sauerkraut ball recipe. She is avid to find the recipe for the iconic sauerkraut balls served at Brown Derby restaurants in years gone by. James, a retired librarian, wants the recipe for her forthcoming book about the treasured recipes of Akron. She has collected quite a few recipes, but despite some serious research, the sauerkraut ball recipe continues to elude her. The recipe was shared by the Brown Derby and printed in the Beacon Journal’s Action Line column decades ago. According to a 1970 article, the newspaper mailed 550 copies of the recipe to readers, so someone in the Akron area is bound to have it, says Judy. If you have the recipe, or even a clue about where to find it, contact her at akronrecipeproject@gmail.com. Yay! Thanks for today’s recipe (Shrimp ACC)… my Christmas Day appetizer! You have the greatest readers. For those who might recreate the dish, the Club served its signature appetizer in small individual ramekins finished in a salamander (broiler) with toast points on the side for dipping in the sauce…damn, I’m drooling again! I may have to try this. Alix, who sent the recipe, points out that despite my skepticism, the Akron General cookbook version really does specify just 1/2 teaspoon of Diablo Sauce and 1/2 teaspoon of chutney. I can’t imagine 1/2 teaspoon of either would add much flavor to 1 1/2 cups mayo and chili sauce. I suggest tasting and doctoring according to your own discretion. With the closing of West Point Market, I tried making the Killer Brownies recipe the Beacon Journal published recently (https://www.ohio.com/akron/lifestyle/west-point-market-killer-brownies-how-you-can-make-them-at-home). It’s also the same one in (former owner) Russ Vernon’s cookbook that came out a few years ago. The first part of the recipe is where I am having trouble, after mixing the batter and baking the first layer. After it is in the oven for 25 to 30 minutes, the consistency of the brownies is liquid. I’ve tried cooking them longer, which is almost an hour to get the batter firm. But then the top gets really hard and the rest of the brownies are hard when fully cooked. So what am I doing wrong? Anyone else have this problem? That recipe was posted in September to the newspaper’s website, based on an article written in 2013. It is not my story, so I don’t know much about it. I could not access the 2013 recipe in the Beacon Journal’s database to determine if a mistake had been made in reprinting it in September, and I no longer have the West Point cookbook to compare. “… the brownies are baked in three steps. The bottom layer is briefly baked, rapped on the counter to make the batter fall, and baked a few minutes more. When cool, the partially baked layer is slathered with caramel, dotted with chocolate chips and frozen. When everything is rock hard, the top layer is added and the brownies are baked some more. Freezing keeps the caramel layer in place and prevents the bottom layer from over baking. Heat oven to 350 degrees. By hand or with a mixer, mix dry cake mix and butter. Beat in cream. Stir in walnuts by hand. Spread half of the dough in the bottom of a lightly buttered and floured, 9-inch-square baking pan. Bake 5 minutes. Remove from oven and bang on counter to make brownies fall. Bake 3 to 4 minutes longer. Remove from oven and cool to room temperature. Refrigerate until cold. Spread caramel topping over brownie layer. Sprinkle with chocolate chips. Freeze until firm. Crumble remaining dough and scatter evenly over frozen caramel layer. Bake at 350 degrees for about 20 to 25 minutes, until top is dry. Cool completely, then refrigerate until firm. Cut into squares and dust with powdered sugar. Store in refrigerator or freeze. Bring to room temperature to serve. I read with alarm about your waning interest in Belgrade chicken. Twice our “to go” chicken from Belgrade was soggy, too — a new experience. Determined to continue my 60-plus-year affair with a childhood love, I immediately dumped the chicken out of the to-go bucket and into a basket at home. Voila! Sogginess gone. So please don’t give up. Some things are worth a little loyalty despite changes in the kitchen. Keep the lard in your life!! My cracker epiphany can be your solution for a holiday pot luck. What could be easier or more on point than assembling a charcuterie board of high-quality salami, olives, cheeses and crackers? If you’re known as a good cook, you probably don’t want to duck the kitchen completely. That’s where my cracker epiphany, parts one and two, come in. About a decade ago I tasted homemade crackers at a book signing for a friend. They were so tender and delicious I had to restrain myself from gobbling them all up. Then later I bought an outrageously priced box of gourmet hot pepper crackers at West Point Market. That was epiphany part two, the one that sent me scurrying to the kitchen. I remember developing the recipe for the hot-pepper crackers and printing it in Second Helpings, the online column I wrote for the Akron Beacon Journal. 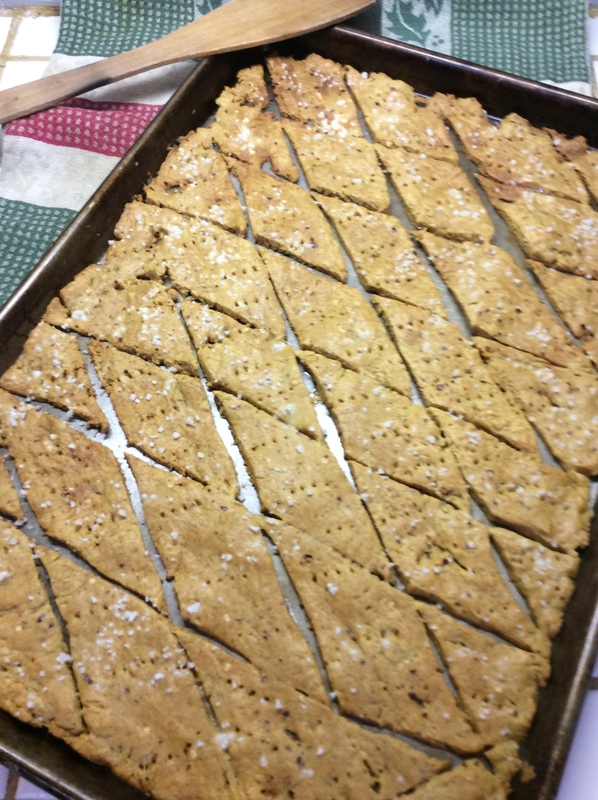 When the recipe miraculously surfaced last week, I made the crackers again. I timed myself, and the dough took 10 minutes to make in my food processor and 15 minutes to press into the bottom of two baking sheets — not a great investment of time considering the results. The pressing part is kind of a pain and you may think you don’t have enough dough for two baking sheets, but keep going. The dough will be almost see-through, but must be that thin to become crispy. The crackers are stinging hot due to the amount of hot pepper flakes mixed into the dough. They had just the right zing for Tony and me. If your tastes differ, eliminate some or all of the hot pepper. You could replace the pepper with spices such as cracked black pepper or herbs such as dried thyme or minced rosemary. Combine flour, baking powder, salt, pepper flakes, sugar and garlic salt in a food processor and pulse to mix. With motor running, pour oil and Worcestershire sauce through the feed tube, then add water in a thin stream until a soft dough forms and clumps into a ball. If necessary, add a few more drops of water. The dough should be supple, not stiff. Divide dough in half and lightly oil two 11-by-17-inch jelly roll pans. Place a piece of dough on one pan and cover with plastic wrap. With your hands or a small rolling pin or dowel, spread dough evenly over bottom of baking sheet. the dough will be very thin. Repeat with remaining dough in other pan. With a sharp knife dipped in water, cut dough into squares or diamonds. Pierce dough all over with a fork. Brush with the egg mixture and sprinkle lightly with sea salt. Bake at 400 degrees for about 10 minutes, until edges begin to brown. Cool in pans, then break into pieces. Store in an airtight container. Szechuan pork stir fry with slivered Brussels sprouts, carrots and onion (bottom of the vegetable bin) over rice; orange butter cookies with orange icing; Italian sausage, onions and tomatoes over polenta; venison chili; baked pumpkin custard; roast pork, dill pickle, Swiss cheese and mustard sandwich. A hamburger with sautéed onions, mustard and pickle with fries at Five Guys; fried chicken (leg and thigh), hot rice, coleslaw at Belgrade Gardens in Barberton (soggy chicken; I’m over Barberton chicken, I think); blue cheese burger, sweet potato fries at Mustard Seed Market in Highland Square; grilled cheese sandwich, Macedonian bean soup, hot tea at Village Gardens in Cuyahoga Falls. Good morning! I have been wondering if you or my fellow readers have any recommendations for a gourmet grocery store that is “like” West Point Market. Preferably in Summit, Stark, Medina or Portage counties but further north is OK, too. There is a void that needs filling! You could expand your search to the entire United States and would not find another store like West Point Market. While Russ Vernon ran it, West Point was the finest specialty grocery store in the country, with the awards to prove it. I, too, have searched for alternatives for unusual ingredients or just upscale ingredients such as French fleur de sel and specific imported cheeses. I haven’t found any one store that satisfies all my needs. I have cobbled together a network that usually but not always produces results. Earth Fare and Mustard Seed Markets have good delis and cheese sections. Mustard Seed and wine stores are good bets for wine. Krieger’s has some gourmet products you wouldn’t expect, along with a broader-than-average selection of top-quality produce; Kirbie’s in Stow and Sherman Provision in Norton have great meat. Chicken that has not been hard-chilled, which we non-government types call “frozen,” is available at DiFeo’s. Aldi’s has good, reasonably-priced imported chocolate (but nothing compares to Akron’s own Temo’s). For bread, I now recommend the Brimfield Bread Oven unless you want the best Italian bread you’ve ever had, which is Massoli’s, available at the bakery at 157 Brittain Rd. in Akron and at DeViti’s on Tallmadge Avenue, also in Akron. I miss West Point too much to shop at Whole Foods 365 in the Wallhaven area of Akron, which is sitting atop West Point’s former property. You might try that, along with Trader Joe’s in Beachwood and any of the large-format Giant Eagle Marketplace stores. Did I miss any? William B. can find the nuts (in the shell) he is looking for at Dannemillers in Norton on Hametown Road. The phone is 330-825-7808. Thanks for the tip. I plan to visit soon for other purchases. Regarding filberts and almonds in the shell, the Giant Eagle in Montrose has them in bulk. Thanks. I imagine that means other Giant Eagle stores carry them as well. To read that you never tasted the Akron City Club’s famous appetizer nearly brought me to tears! Being served Shrimp ACC was always the highlight of my meals there, whether as a child guest of a relative who belonged, or as one of the first handful of women admitted to membership. But reminiscences aside, I seem to recall that recipe being sought and finally found and printed in the Beacon Journal eons ago. I hope you can help find it once again…it is a delicious reason to make and serve toast points once again. I don’t remember printing that recipe (but my memory often tricks me these days), and I couldn’t find it in a search of the Beacon Journal’s database. However, help is at hand. Read on. Shrimp ACC was a fabulous dish but when I went to the Akron City Club I was afraid to order the most expensive thing on the menu. A lovely woman named Ruby served in the ladies’ dining room and passed out divine sticky buns, one to each guest. The recipe for Shrimp ACC is in the Akron General Cook Book (published in 1961) along with their wonderful Crabmeat Ravigote. Unfortunately you can no longer purchase the Escoffier Diablo Sauce the recipe calls for but there is a recipe for it on the Internet. Place the seafood in a casserole dish. Combine remaining ingredients and pour over seafood. Sprinkle with Parmesan and a few tablespoons melted butter. Bake at 400 degrees until nicely browned. Serve over toast points. Note: A-1 Sauce may be substituted for the discontinued Escoffier sauce. Or a copycat recipe can be found here: http://www.hungrybrowser.com/phaedrus/m0115M07.htm.